When it comes to developing business strategy, we often leave that up to the business people. But what about the “others?” You know, the folks in technical areas critical to an organization’s success. These are the people with expertise in areas such as research & development, clinical development and information technology. Do they need to be strategic? If we define strategy as “the intelligent allocation of limited resources through a unique system of activities to outperform the competition in serving customers,” it’s obvious that technical experts play an important role. After all, they have resources (time, talent and budget) just like their colleagues in more commercial areas such as marketing, sales and finance. Their ability to effectively use these resources can dictate the success or failure of the organization. IT managers and those in other technical areas have the capacity to become experts in strategic thinking. When we consider that strategic thinking is the ability to generate and apply business insights, it makes perfect sense that technical experts would already have great aptitude because of their ability to generate technical insights. 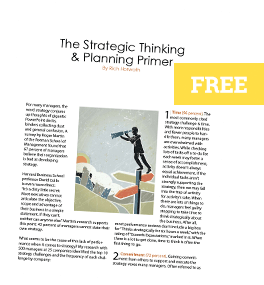 In most cases, they simply haven’t been exposed to and educated on the key concepts and tools to think strategically from a business perspective. Sometimes what we don’t know not only hurts us, it prevents us from reaching our true potential. Technically speaking, of course.